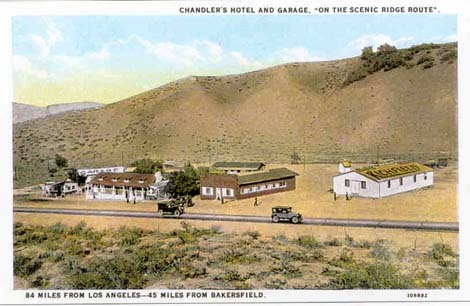 The small settlement of Chandler was once located a short distance south of the I-5 Frazier Park exit. Today it is under the northbound lanes of the freeway. A man named Chandler owned the site. There were several small houses, a motel, Richfield gas station, garage and restaurant. Mr. Chandler raised pigeons in the back and served them in his cafe.